Care providers require intuitive imaging results, and Visage Ease delivers. Compared to x-ray film or patient CDs, the Visage 7 Enterprise Imaging Platform in combination with Visage Ease provides a much richer and convenient form of imaging results communication. Authorized users have access to imaging results, when and where they need it. Developed as an native app, Visage Ease imaging results are intuitively displayed in portrait or landscape mode, and are optimized whether viewing on iPad, iPhone or iTouch devices. 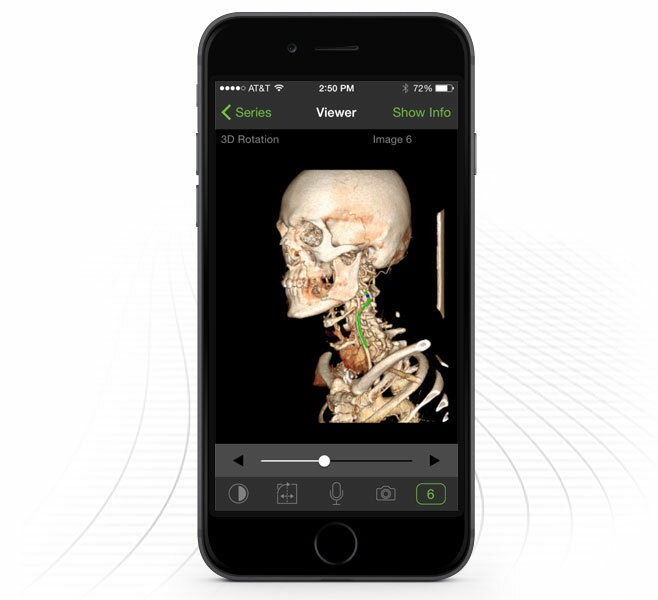 Visage Ease enables the visualization of images, as well as the radiology report (if available), taking advantage of iOS’s multi-touch gestures and Visage Ease image controls for optimal usability. Visage Ease does not require end user calibration checks. Integrated barcode scanning allows users to scan patient barcodes, via wristband and/or other digital or paper patient documentation, to rapidly query for and conveniently display all of a patient’s imaging studies available on Visage 7. All imaging modalities supported by the Visage 7 Enterprise Imaging Platform are available for rapid display via Visage Ease, even for example, massively large DBT and Cardiac CTA studies. DICOM Window/Level presets tied to a user’s Visage 7 profile are available on Visage Ease. Visage Ease enables authorized users to attach photos and images from their iOS devices to imaging studies managed by the Visage 7 Enterprise Imaging Platform. Visage Ease enables authorized users to attach voice memos recorded from their iOS devices to imaging studies managed by the Visage 7 Enterprise Imaging Platform.